Several options in the reusable packaging arena can help reduce or eliminate the need for plastic stretch wrap. Solutions such as reusable pallet wrappers, rubber bands, lid or cap and strap systems, as well as bulk containers can all help get the job done while achieving packaging reduction. Lid and strap systems have achieved high levels of penetration in industries such as manufacturing, especially automotive, where they are often used in combination with reusable container systems. The lid and strap system can also be effectively used with mixed size containers – either reusable or single use. “(The Lid) Works with pretty much anything so long as you can manufacture a reasonably even load to put it on,” commented Edward Fanshawe, Sales Manager at Loadhog Ltd. 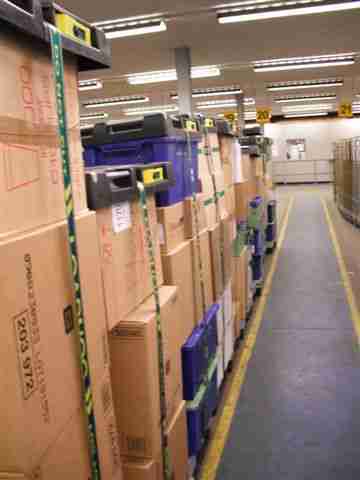 The Lid also works great in combination with reusable container systems, such as at the Royal Mail and Honda. Reusable wrappers can also effectively take the place of plastic stretch wrap, according to reusable wrapper vendors. “The Envirowrapper (www.envirowrapper.com) will work on any size and shape of pallet load,” said Frank Gallucci, President of Amici Enterprises, the manufacturer of the Envirowrapper. 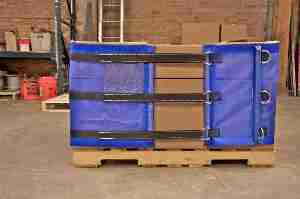 “We have found that the 72” unit has become the best selling size as it allows the shipper to maximize the cube of the pallet and also the trailer.” Frank indicated that for skids of 30″ in height, his experience has been that plastic stretch wrap is still the preferred solution. I first wrote about Frank and the Envirowrapper back in 1998. (View that Pallet Enterprise story here.) Overwaitea Food Group remains one of his best customers. After displaying at the PACK EXPO show in October 2009, Amici Enterprises generated over 100 solid leads. One new customer is McKesson Drugs. Bottom line, says Matt Jacobs, of Pallet Wrapz, a recent entrant into the reusable wrap category is that reusable load wrappers can not only save money, but can also reduce solid waste. Pallet Wrapz recently came to market after initially having been rolled out at Testa Produce in Chicago. Once order selectors become skilled with the Pallet Wrapz, indicated Jacobs, they can apply it in around 30 seconds. 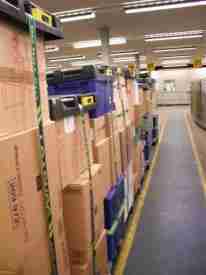 The Pallet Wrapz are ideally suited for an operation such as Testa, which runs 55 of its own trucks. 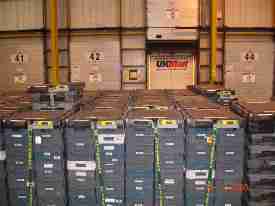 Upon delivery, drivers remove the Pallet Wrapz and return them to the warehouse. “Proper training is a must and we assist at all levels to ensure the trainers are properly trained – to work and train the rest of their staff member,” Frank stated. For more information on the vendors listed in this article, visit their websites. Thank you for profiling these alternatives to stretch wrap. I have heard from many supply chain managers that are interested in reusable alternatives to stretch wrap and other films. This article includes some great examples. Please consider Aero Rubber Company’s natural rubber “Pallet Bands”. Thousands of satisfied customers have saved a great deal of time and money using our bands. 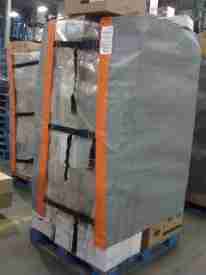 They offer a great way to reduce pallet wrap costs and add to your company’s “Green” efforts at the same time.